The Solemnity of Mary, the Mother of God: "Born of a woman"
Mary is truly "Mother of God" since she is the mother of the eternal Son of God made man, who is God himself. Throughout the Old Covenant the mission of many holy women prepared for that of Mary. At the very beginning there was Eve; despite her disobedience, she receives the promise of a posterity that will be victorious over the evil one, as well as the promise that she will be the mother of all the living. By virtue of this promise, Sarah conceives a son in spite of her old age. Against all human expectation God chooses those who were considered powerless and weak to show forth his faithfulness to his promises: Hannah, the mother of Samuel; Deborah; Ruth; Judith and Esther; and many other women. Mary "stands out among the poor and humble of the Lord, who confidently hope for and receive salvation from him. After a long period of waiting the times are fulfilled in her, the exalted Daughter of Sion, and the new plan of salvation is established." 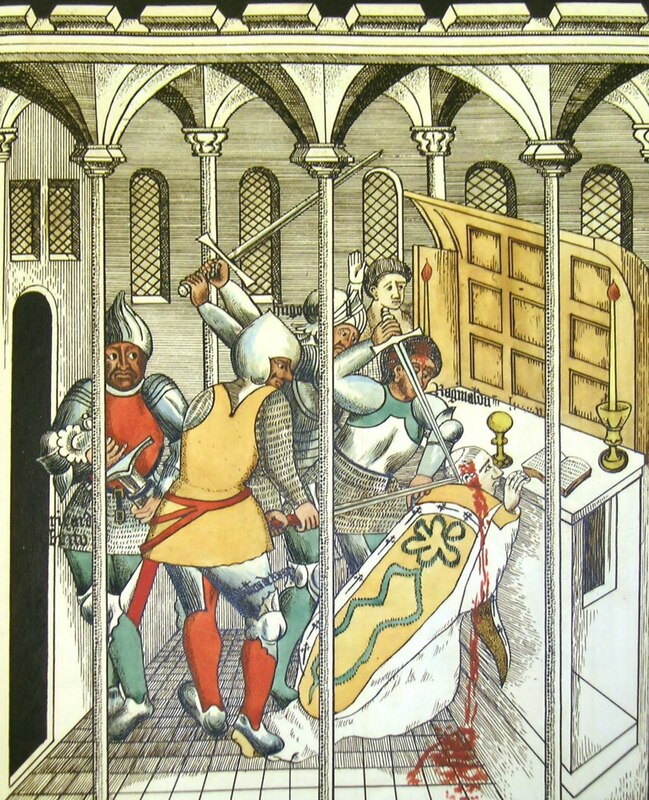 Saint Thomas Becket, martyr: "Whoever hates his brother is in darkness"
the darkness has blinded his eyes. Deliberate hatred is contrary to charity. Hatred of the neighbor is a sin when one deliberately wishes him evil. Hatred of the neighbor is a grave sin when one deliberately desires him grave harm. "But I say to you, Love your enemies and pray for those who persecute you, so that you may be sons of your Father who is in heaven." 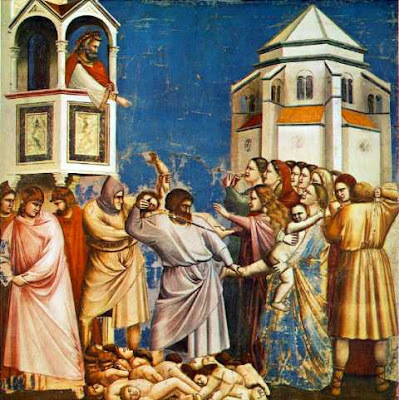 Holy Innocents, martyrs: "I lay down my life"
if we walk in the light as he is in the light, then we have fellowship with one another, and the Blood of his Son Jesus cleanses us from all sin. The Son of God, who came down "from heaven, not to do [his] own will, but the will of him who sent [him]", said on coming into the world, "Lo, I have come to do your will, O God." "And by that will we have been sanctified through the offering of the body of Jesus Christ once for all." From the first moment of his Incarnation the Son embraces the Father's plan of divine salvation in his redemptive mission: "My food is to do the will of him who sent me, and to accomplish his work." The sacrifice of Jesus "for the sins of the whole world" expresses his loving communion with the Father. "The Father loves me, because I lay down my life", said the Lord, "[for] I do as the Father has commanded me, so that the world may know that I love the Father." 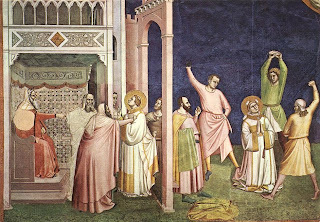 Feast of Saint John, Apostle and evangelist: "we have seen"
Saint Stephen, first martyr: "You will be hated by all"
... because of my name, but whoever endures to the end will be saved. Believing in Jesus Christ and in the One who sent him for our salvation is necessary for obtaining that salvation. "Since "without faith it is impossible to please [God]" and to attain to the fellowship of his sons, therefore without faith no one has ever attained justification, nor will anyone obtain eternal life 'But he who endures to the end.'" 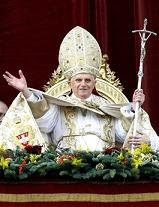 December 24: “Blessed be the Lord"
... the God of Israel; for he has come to his people and set them free. "There was a man sent from God, whose name was John." John was "filled with the Holy Spirit even from his mother's womb" by Christ himself, whom the Virgin Mary had just conceived by the Holy Spirit. 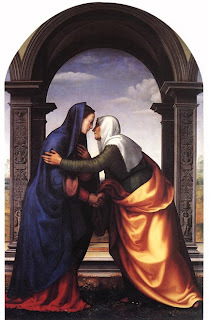 Mary's visitation to Elizabeth thus became a visit from God to his people. O EMMANUEL, God with us, Our King and Lawgiver, the expected of the nations and their Saviour: COME to save us, O Lord our God. And the messenger of the covenant whom you desire. Yes, he is coming, says the LORD of hosts. And who can stand when he appears? For he is like the refiner’s fire, or like the fuller’s lye. He will sit refining and purifying silver, and he will purify the sons of Levi, Refining them like gold or like silver that they may offer due sacrifice to the LORD. 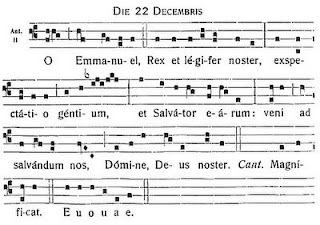 December 22: "O Rex Gentium"
Full of grace, the Lord is with thee: These two phrases of the angel's greeting shed light on one another. Mary is full of grace because the Lord is with her. The grace with which she is filled is the presence of him who is the source of all grace. "Rejoice . . . O Daughter of Jerusalem . . . the Lord your God is in your midst." Mary, in whom the Lord himself has just made his dwelling, is the daughter of Zion in person, the ark of the covenant, the place where the glory of the Lord dwells. She is "the dwelling of God . . . with men." 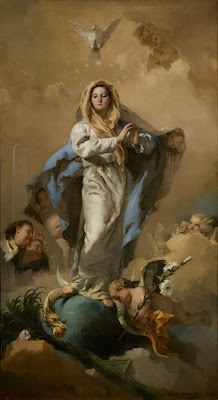 Full of grace, Mary is wholly given over to him who has come to dwell in her and whom she is about to give to the world. 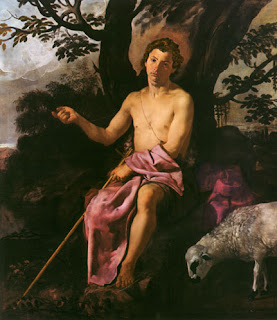 December 20: "O Clavis David"
O KEY OF DAVID, and Sceptre of the House of Israel, who opens and no man shuts, who shuts and no man opens: COME, and bring forth the captive from his prison, he who sits in darkness and in the shadow of death. 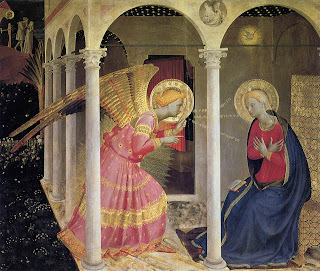 Fourth Sunday of Advent: "Blessed art thou"
Blessed art thou among women and blessed is the fruit of thy womb, Jesus. After the angel's greeting, we make Elizabeth's greeting our own. "Filled with the Holy Spirit," Elizabeth is the first in the long succession of generations who have called Mary "blessed." "Blessed is she who believed. . . . " Mary is "blessed among women" because she believed in the fulfillment of the Lord's word. Abraham, because of his faith, became a blessing for all the nations of the earth. Mary, because of her faith, became the mother of believers, through whom all nations of the earth receive him who is God's own blessing: Jesus, the "fruit of thy womb." For Meeting Christ in the Liturgy reflection for the Fourth Sunday of Advent click here. December 19: "O Radix Jesse"
Angels have been present since creation and throughout the history of salvation, announcing this salvation from afar or near and serving the accomplishment of the divine plan: they closed the earthly paradise; protected Lot; saved Hagar and her child; stayed Abraham's hand; communicated the law by their ministry; led the People of God; announced births and callings; and assisted the prophets, just to cite a few examples. Finally, the angel Gabriel announced the birth of the Precursor and that of Jesus himself. The Gospel accounts understand the virginal conception of Jesus as a divine work that surpasses all human understanding and possibility: "That which is conceived in her is of the Holy Spirit", said the angel to Joseph about Mary his fiancee. The Church sees here the fulfillment of the divine promise given through the prophet Isaiah: "Behold, a virgin shall conceive and bear a son." “Rejoice." Our Church calls to us with the voice of God in the holy Scriptures today, "Rejoice in the Lord always!" But with the evil we see in the world, especially such senseless horror as we all witnessed in Connecticut last week, does it not seem somewhat scandalous, or at least insensitive, to call for rejoicing? And yet, our Church with the love of God for all of us, nevertheless reminds us that we “always” have reason and need to rejoice. My strength and my courage is the LORD"
In the face of evil we mourn with those who mourn in loving compassion. And in the coming days we will be amazed and awed at the goodness of those who fought against the evil actions of a single young man at the elementary school, who bravely stood up against evil in order to defend the weak and the innocent: a principal who fought and died as he shot his way into the building, a young teacher who died defending her young students with her own body. This is the kind of rejoicing about which God speaks in the Scriptures: the love of God manifest in the human person which can bring good out of every evil. And we follow and love a God who is on the cross not for Himself, but completely for us, fighting evil and sin with us and in us so that we can have true joy, authentic “happiness", with His help. Human priorities sometimes clash with God's. Sometimes human beings put other things before salvation in order of importance, such as total comfort, no suffering or pain in this life. And sometimes, when they don't get this, people turn against God, stop going to church, stop believing. But the Lord will not change His priorities for us because He know in His holy wisdom what we need most of all, which is the kind of joy which can never be taken away, the joy of heaven itself. Some people will always find this scandalous and will always reject this truth unless they first undergo a conversion to love of God and His will. Which brings us to the one thing which can jeopardize God's heavenly promise for us: sin. Because sin is incompatible with God's good and holy plan for our eternal happiness with Him, he insists that we go to Christ crucified and risen for forgiveness. "Shout for joy, O daughter Zion! you have no further misfortune to fear." God's mercy in Jesus Christ makes it possible for us to fear no misfortunes in this world. God says that true joy, real happiness, can never come from looking only at what's wrong with the world but rather comes in the first place by facing what's wrong with ourselves and asking His help to fix it and int hat way, beginning to fx what is wrong with the world. will guard your hearts and minds in Christ Jesus." 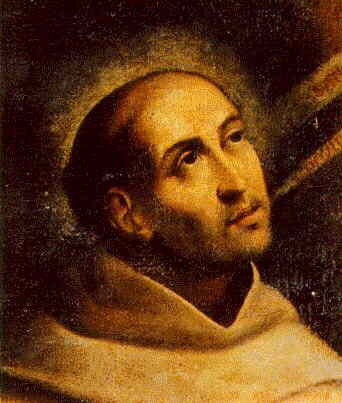 St John of the Cross: "take up your cross"
According to St. John of the Cross, the person wishing to advance toward perfection should "take care into whose hands he entrusts himself, for as the master is, so will the disciple be, and as the father is so will be the son." And further: "In addition to being learned and discreet a director should be experienced. . . . If the spiritual director has no experience of the spiritual life, he will be incapable of leading into it the souls whom God is calling to it, and he will not even understand them. Solemnity of the Immaculate Conception: “Hail, full of grace!" The Church celebrates the birth of our Lady on September 8 and today, nine months prior, her Immaculate Conception. "The most blessed Virgin Mary was, from the first moment of her conception, by a singular grace and privilege of almighty God and by virtue of the merits of Jesus Christ, Savior of the human race, preserved immune from all stain of original sin. 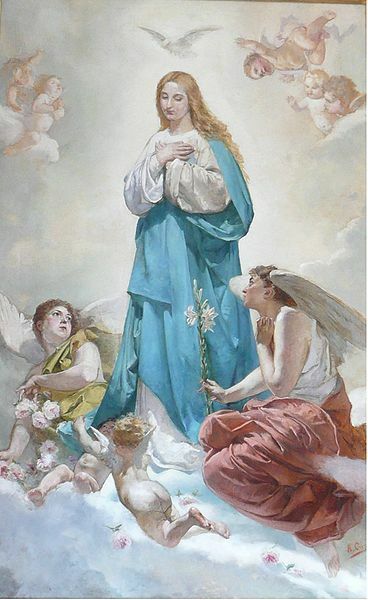 (Pius XI, Ineffabilis Deus, 1854: DS 2803)"
Art: Inmaculada Concepción o/l. 147x94 cm. Firmada A. Cortina, 1876. S Ambrose: "run and not grow weary"
Age of body does not determine age of soul. Even in childhood man can attain spiritual maturity: as the book of Wisdom says: "For old age is not honored for length of time, or measured by number of years. "Many children, through the strength of the Holy Spirit they have received, have bravely fought for Christ even to the shedding of their blood. 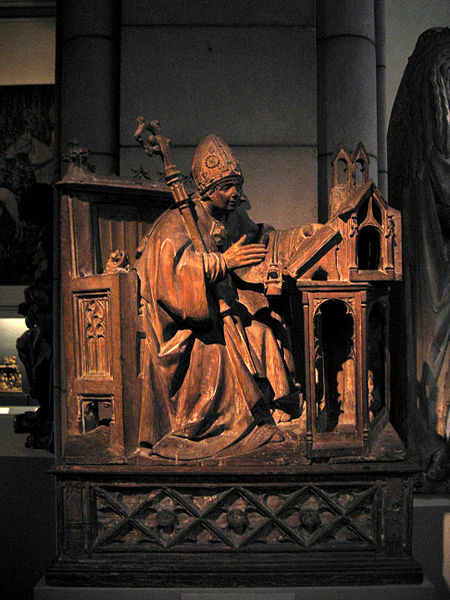 St Nicholas. That "not...one of these little ones be lost"
"On this mountain the LORD of hosts will provide"
For the Christian the day of death inaugurates, at the end of his sacramental life, the fulfillment of his new birth begun at Baptism, the definitive "conformity" to "the image of the Son" conferred by the anointing of the Holy Spirit, and participation in the feast of the Kingdom which was anticipated in the Eucharist- even if final purifications are still necessary for him in order to be clothed with the nuptial garment. S John Damascene: "Take as your norm the sound words you have heard from me"
The Word became flesh to be our model of holiness: "Take my yoke upon you, and learn from me." "I am the way, and the truth, and the life; no one comes to the Father, but by me." On the mountain of the Transfiguration, the Father commands: "Listen to him!" Jesus is the model for the Beatitudes and the norm of the new law: "Love one another as I have loved you." This love implies an effective offering of oneself, after his example. St Francis Xavier: "If I preach the Gospel, this is no reason for me to boast"
First Sunday of Advent: "Be vigilant at all times"
Archbishop Wuerl of Washington once made the humorous observation that “one knows it’s time for Halloween when the Christmas decorations come out” in the stores. This sad commentary on the power of merchandising over the proper and meaningful celebration of the seasons of life and the mysteries of our Faith is all too true. We are reminded of this every year as we observe once again the clash of colors between Advent violet in our churches and Christmas red splashed liberally beyond the doors of our places of worship. And, again, the temptation arises for some to complain about the situation or to see this phenomenon as another in a growing list of reasons to turn away from the world. Advent, the season of preparation in the Church, provides a dramatic counterpoint over against a world that ends the celebration of the Savior’s birth precisely on the day it should begin, having commenced the observance months prematurely. Such superficial “cheer” spurs us all the more to love and embrace the yet unredeemed world that stills lacks, and waits unknowingly, for what it most truly needs. Advent, with its very name, “the coming”, is a yearly season of the Church’s life that invites us to explore once again the important virtue of patience accompanied by prayer. For the faithful there is not a simple “waiting” but rather an active anticipation by prayer, penance and almsgiving. The Lord engages with the world through His Body to work out the salvation of all creation. The Holy Spirit, our companion on the way of faith, is the Divine person who “inspires” us to return again and again to the truth that salvation is not something for which we passively wait in this world, but a reality that has begun already for us in the Church. The Holy Spirit, the “animator”, soul, or divine Indweller of Jesus’ Body the Church, guarantees for us that we live now already the very life and mysteries of the Savior. This takes place liturgically, in the living proclamation and true presence of the Incarnate Word in our liturgy. How important for us is His coming? No less important for us then the preparation for the “advent” of so great a divine Savior. It is the reasonableness of this truth that is our privilege to live and teach the world in Advent. We are thus as a leaven so that all of society and every human person may “rise” with the Bread of Life who really and truly became present among us and ever comes among us again the His Eucharist as the Risen One. He became incarnate to become Sacrifice. He is present among us to save us. Our Advent violet is a calling to joy for the world, for one must truly prepare for what one hopes to truly receive. The Church lives as a sign of hope in this Advent season once again in the midst of a world in need of redemption. Let us go forth to celebrate the real joy that Advent brings, the authentic coming of the Lord and Savior, as one who will live in our hearts and minds by grace upon His coming at Christmas. If we would do that, we must prepare the way. "Prepare the way of the Lord, make straight His paths!" Image: The Holy Father inaugurates the use of his new pastoral cross, or ferule, at first vespers for the first Sunday of Advent. "An angel showed me the river of life-giving water,"
The book of Revelation of St. John, read in the Church's liturgy, first reveals to us, "A throne stood in heaven, with one seated on the throne": "the Lord God." It then shows the Lamb, "standing, as though it had been slain": Christ crucified and risen, the one high priest of the true sanctuary, the same one "who offers and is offered, who gives and is given." Finally it presents "the river of the water of life . 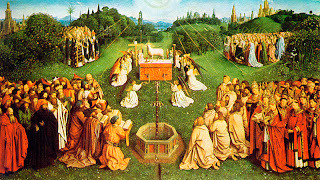 . . flowing from the throne of God and of the Lamb," one of most beautiful symbols of the Holy Spirit. "one who looked like a son of man"
Being seated at the Father's right hand signifies the inauguration of the Messiah's kingdom, the fulfillment of the prophet Daniel's vision concerning the Son of man: "To him was given dominion and glory and kingdom, that all peoples, nations, and languages should serve him; his dominion is an everlasting dominion, which shall not pass away, and his kingdom one that shall not be destroyed." After this event the apostles became witnesses of the "kingdom [that] will have no end". "there was the Lamb standing"
Mexico. 1927. 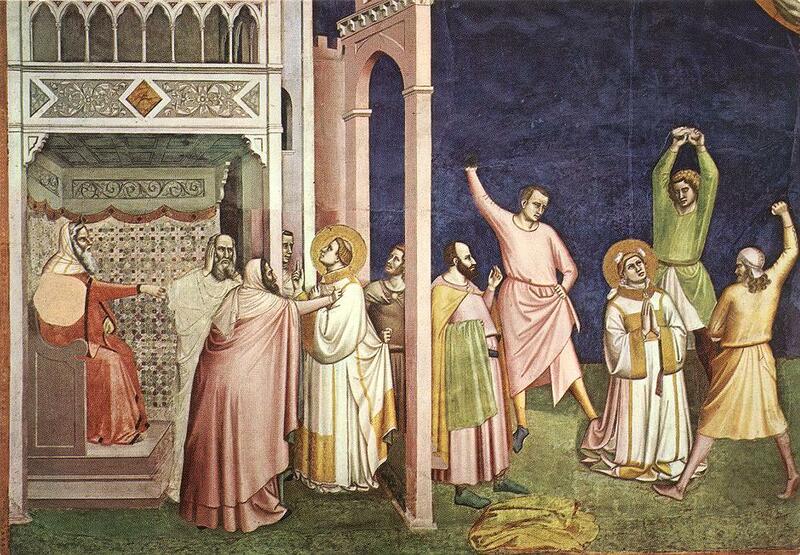 A priest is brought before a uniformed military firing squad. As he walks from his cell to the courtyard and the firing squad, he blesses the soldiers, kneels and briefly prays quietly. Declining a blindfold, he faces his executioners with a crucifix in one hand and a rosary in the other and holds his arms out in imitation of the crucified Christ and shouts out, "May God have mercy on you! May God bless you! Lord, Thou knowest that I am innocent! With all my heart I forgive my enemies!" 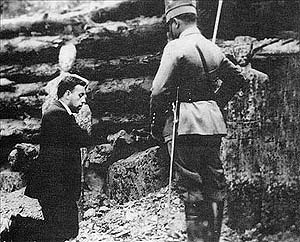 Before the firing squad were ordered to shoot, the priest raises his arms in imitation of Christ and shouts the defiant cry of the Cristeros, the Christian rebels, "Viva Cristo Rey!" 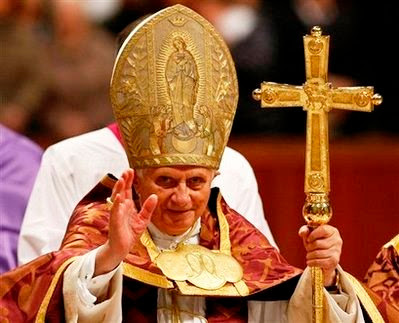 -"Long live Christ the King!". When the initial shots of the firing squad fail to kill him, a soldier shoots him point blank. 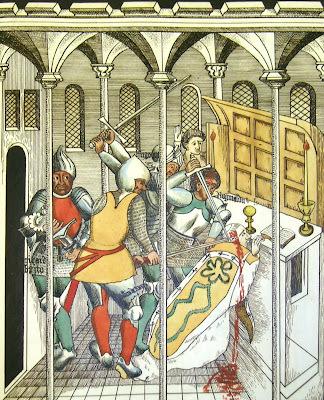 Who is this priest and why was he considered such a threat to powerful men that he had to be gotten out of the way? The priest is Blessed Father Miguel Pro, arrested and executed for doing what priests do: saying Mass and saving souls. You see, the government had passed laws making it virtually illegal for Catholics to practice their faith and for priests and other religious leaders to make themselves known in public. Masses and other forms of religious expression had to be done privately if at all by those who had not already given up the practice of the faith out of fear. “An assassination attempt by bombing against Álvaro Obregón (which only wounded the ex-president) in November 1927 provided the state with a pretext to capture Pro and his brothers Humberto and Roberto. A young engineer who was involved and confessed his part in the assassination testified the Pro brothers were not involved. Miguel and his brothers were taken to the Detective Inspector's Office in Mexico City. “On November 23, 1927, Fr. Pro was executed without trial. President Calles gave orders to have Pro executed under the pretext of the assassination, but in reality for defying the virtual outlawing of Catholicism. Calles had the execution meticulously photographed, and the newspapers throughout the country carried them on the front page the following day. Presumably, Calles thought that the sight of the pictures would frighten the Cristero rebels who were fighting against his troops, particularly in the state of Jalisco. However, they had the opposite effect. Today we call Father Pro a “blessed” of the Church for his intrepid witness of the Faith in the face of certain death, a hero to us all. What does his life and death say to us? He had declared Christ his King and he went to his death with that cry on his lips. In our Church around the world today we acclaim Christ our King in our public worship. Do our lives reflect that Jesus Christ is Lord and King? Before we can answer these questions we must first know what kind of Kingdom it is that Jesus Christ rules over. In the Gospel He declares that His Kingdom is “not of this world” and that it is of “truth”. Blessed Miguel Pro seemed to our human eyes to have met defeat at the hands of his enemies and persecutors just as it seemed for so many on Calvary at the foot of the Cross 2,000 years ago. To our eyes a man dying under a violent death at the hands of his enemies seems lost, abandoned, defeated. But not so for Christ and those of His Kingdom; not if such a death is as the result of humble witness to the Truth. In that witness, whether our Sunday worship here, our lives during the week or the death of martyr Miguel Pro, we share in the victory of God whose Kingdom grows in our midst as we thus love and serve Him. We speak the truth even though everyone around us may seem to have given in to lies and falsehoods, or false gods and empty creeds. We live a daily martyrdom that refuses to betray God for any rewards this world may offer for those who live as though He and His Kingdom do not exist. On the day of Father Pro's funeral the man responsible for his death, President “Calles is reported to have looked down upon a throng of 40,000 people which lined Pro's funeral procession and another 20,000 waited at the cemetery where he was buried without a priest present, his father saying the final words. The Cristeros became more animated and fought with renewed enthusiasm, many of them carrying the newspaper photo of Pro before the firing squad.” These are but a foretaste and promise of the may throngs of heavenly beings who now intercede for us in the Kingdom of Heaven, gathered as they are around the throne of Christ our King, Blessed Miguel Pro and all the holy saints and after a life of humble witness to the truth in this world. Before we depart today we will proclaim our Faith through the words of the Creed, then we will come forth in procession to receive Jesus Christ whose Kingdom is not of this world. And we will be empowered by His grace to return our lives in worship to Him each day as humble witnesses of Him by lives of truth, justice and love, thus dying to ourselves and our own will so as to live with Him in His Kingdom forever. Amen. Praised be Jesus Christ our King, now and forever.